PAKISTAN NEWS- Even before the dust has been settled down over the killing of al-Qaeda chief Osama bin Laden, Pakistan has witnessed another brewing. 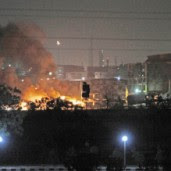 At least 20 heavily armed terrorists attacked Pakistan naval base of the port city of Karachi. In the attack, militants killed five guard and destroyed two surveillance planes. The PNS Mehran located within the Faisal airbase was struck by the terrorists at around 10.40 pm (local time) last night, throwing grenades and firing indiscriminately with automatic weapons, hand grenades and rocket propelled grenades (RPG) that triggered a battle between the security forces and the attackers. This is the headquarters of the Pakistan's naval air arm where in the early morning there were fifteen loud blasts heard. The Tehreek-e-Taliban Pakistan, which has stepped into attacks, from the historic death of the al-Qaeda leader bin Laden has claimed responsibility for this attack. The Taliban spokesman Ehsanullah Ehsan told foreign agencies that after the matyrdom of Osama they had already warned they would carry out even bigger attacks. He further said that the terrorists in the naval base had enough supplies to survive a three day siege. The Pakistani Prime minister Yousuf Raza Gilani dispatched the Interior minister Rehman Malik to Karachi to monitor the situation. He told that the terrorists had entered the base from three different directions. He also said that one building in the premises was still under the control of the terrorists where heavy firing was still going on. He added that the situation tackled very carefully to minimize human losses and secure the assets. He also said that this attack was not only against a navy establishment but also against the whole nation. There are unconfirmed reports of four to five terrorists being either killed or captured by the security forces.